Cockroaches are insects that are members of the order Blattodea. While scientists formerly classified the mantids, stick insects, earwigs, grasshoppers and roaches in the same order, they have recently broken the group into several different orders. Though entomologists have adjusted the classification system, they still think these groups are closely related. Roaches are nocturnal scavengers found all over the world. Scientists have described more than 4,000 species worldwide. Roaches are fast, crawling insects that sometimes utilize communal hiding spaces. 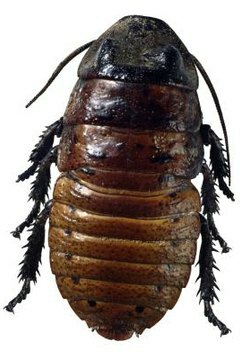 Roaches undergo gradual or incomplete metamorphosis. The 1,000 worldwide earwig species comprise the order Dermaptera. Originally, this order contained grasshoppers and crickets, which are now categorized in the order Orthoptera. As Orthoptera has been elevated to the level of order, the earwigs are the sole remaining members of Dermaptera. Earwigs are among the closest relatives of the cockroaches and exhibit a number of similarities. Earwigs have legs that have evolved for running quickly, just as cockroaches have. The wide variety of foods eaten by earwigs -- including grains, dead animals and paper -- is similar to the opportunistic food habits of roaches. The name Dermatera means “skin wing” and refers to the leathery texture of the animals’ forewings. Grasshoppers, crickets, locusts and their kin make up the order Orthoptera. Most species of this clade have strong, well-developed rear legs used for jumping, though many species can also fly. Many orthopterans produce and hear sounds, either by rubbing their wings together or by rubbing the rear legs against a wing. Grasshoppers, locusts and katydids consume vegetation, but some crickets are scavengers -- some mole crickets may even predate on other insects. More than 20,000 species live worldwide, and many have important economic impacts. Scientists classify stick insects in the order Phasmatodea. Stick insects are herbivores that primarily consume the leaves of trees at night, under the cover of darkness. As most species are unable to jump or fly, stick insects have few defenses other than their remarkable camouflage. The males of many species are smaller than the females; the males of some species ride on the backs of the females for extended periods. Mantids are among the closest relatives to the roaches, and comprise the order Mantodea. Approximately 20 mantid species inhabit North America, while 1,800 species live worldwide. All mantids are predators equipped with highly modified front legs used to grasp their prey. Though it's often incorrectly seen as a sign of intelligence, mantids can rotate their head from side to side -- a trait unique to their order.